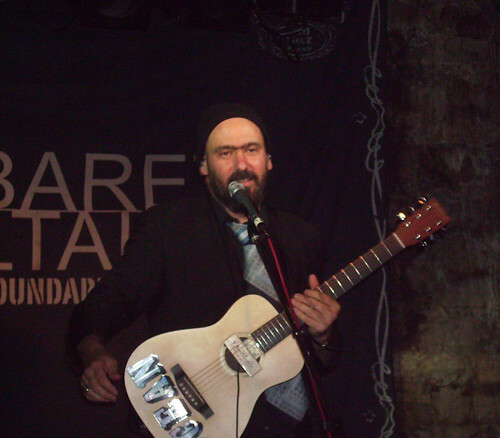 Mark Eitzel has been a favourite of mine for many years. His former band American Music Club were one of the most important US bands of the late 80's-early 90's. Their album California is one of my all-time favourite records. American Music Club recently reformed and put out a new album, but Mark is currently touring solo. I've seen him with AMC and solo several times over the years. When I was in San Francisco last year I spotted a poster for an anti-war rally that he was set to play at. I seriously contemplated doing a 100km trip through the state to catch it, but couldn't do it in the end. Despite his intense lyrics Mark is a pretty witty and self-deprecating guy on stage. He noted that one of his friends had criticised him for playing the same set and telling the same stories for the past six months. He told us that subsequently he would be spending the next evening writing new songs, which of course we wouldn't hear but the lucky people of Exeter would. The set itself stretched from old AMC tunes to solo stuff to new AMC stuff. There was also a a notable cover version of Joy Division's 'Heart and Soul' which had to be heard to be believed. I got some of that on video so I will post it once I can figure out converting it to mpg without all the sound dropping out. Mark spoke about his song Patriot's Hearts, which interweaves imagery of a Columbus Ohio gay strip bar with the events of 9/11 and remarked that it was an anti-nationalist song and that he knew that with independence approaching that was a controversial concept in Scotland. He went on to say that if Scotland did seperate from the 'war mongering' UK state it would be no bad thing. There was even a nice sing-along as Mark forced us to play the part that should be played by the San Francisco Gay and Lesbian choir. A terrific night and probably the best gig I have been to this year. That can be my project for next week!